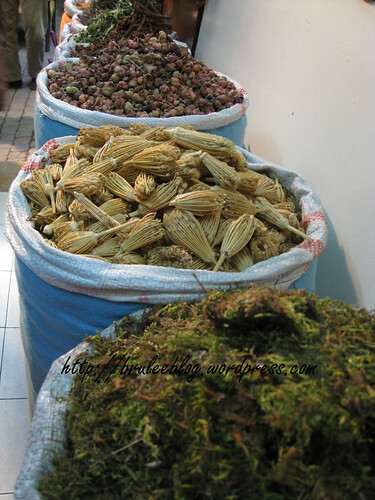 We stopped at a herbal shop/pharmacy/spice shop. The clay items had a stain on the “lid” side. Add a little water or spit, and the stain would rub onto your finger. You’d then rub the stain on your lips as a fairly red lipstick. The things that look like little brooms are used as toothbrushes. I could be wrong but I think the white crystals at the bottom was frankincense. 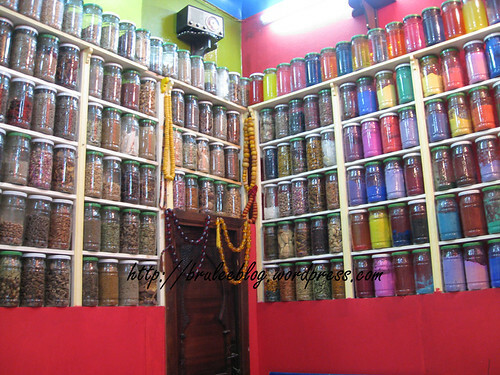 Inside the shop were jars of colourful herbs and spices meant for various uses. 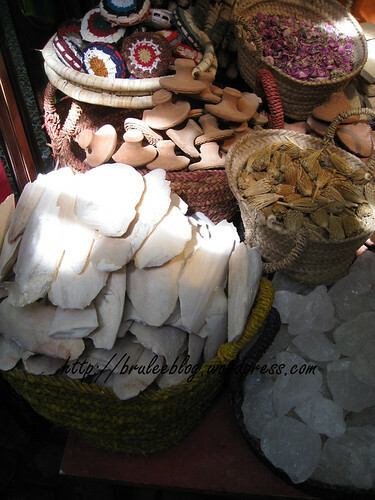 Healing, perfumes, make up… you name it, it was probably there. They gave us a sales pitch and tried to get us to buy some argan oil (usually sold here as an ingredient in Moroccan oil and other make up). 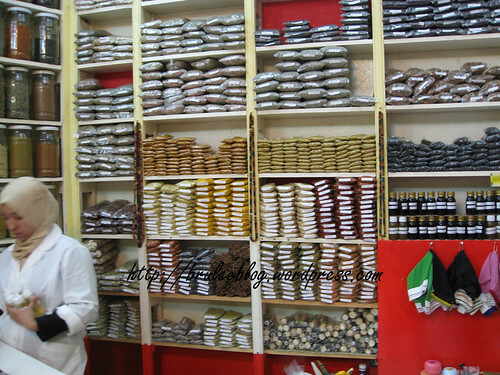 Instead, I gravitated towards the spices. 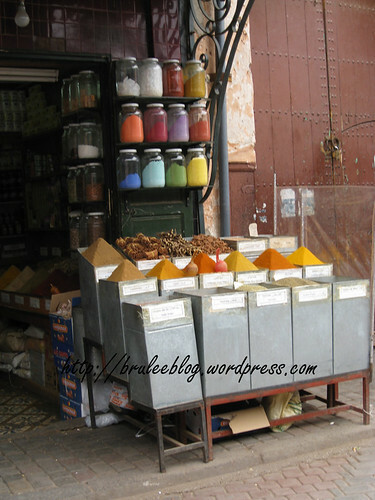 I ended up buying some Ras El Hanout spice mix, saffron, mint tea, and nigella seeds. One spice set that I picked up contained small sample amounts of Ras El Hanout, cumin, paprika, and seafood spice mix. 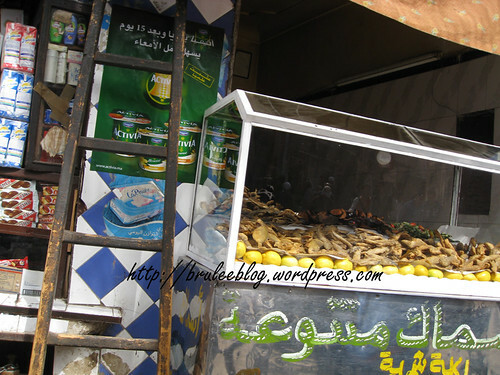 Street food isn’t all street meat. 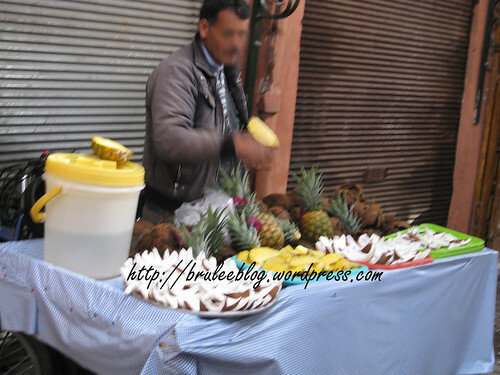 This guy was selling fresh cut pineapple and coconut. 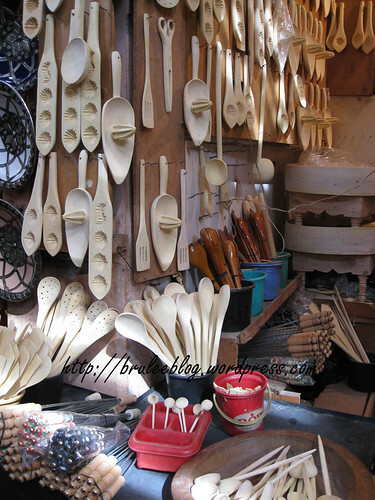 These wooden cooking utensils are made of lemon wood. Juicers, spatulas, and molds. 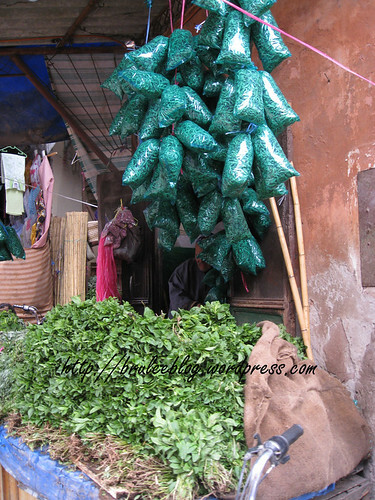 Before I went to Morocco I remember seeing photos of brightly coloured spices shaped into tall pyramids. I only saw spice pyramids twice. One of these times are pictured below, and featured mounds that were a lot smaller than expected. The other time was in a mountain town and had tall pyramids, but those were dried out, cracked, and old. 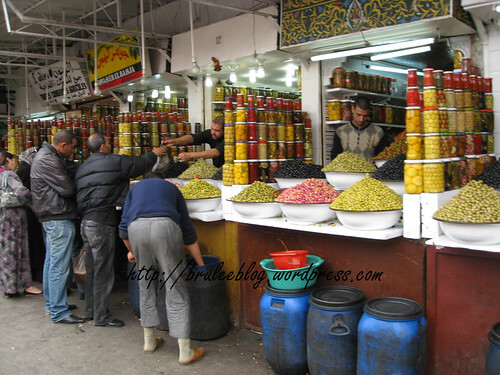 While I like olives, I never really got into eating them often until my Morocco trip. The olives here seemed more mild than the ones I can usually find at home. The pink and white ones were the best! 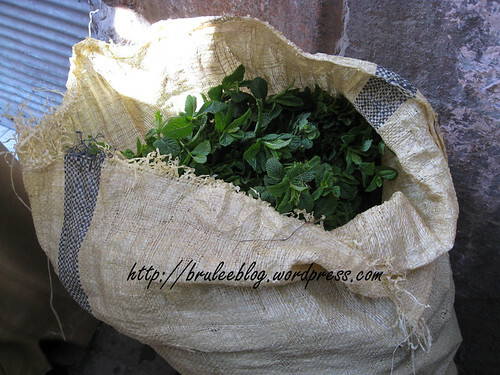 More mint than you’d ever need (unless you live in Morocco). We had to buy these drinks to sit on a balcony overlooking Djemaa el Fna. 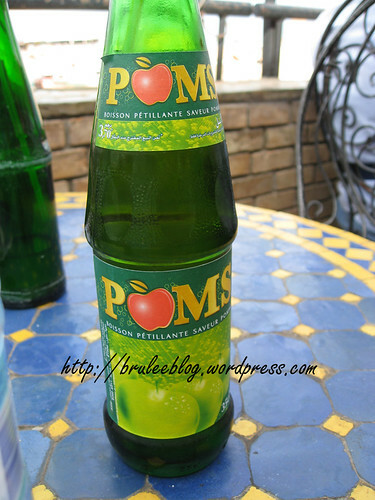 Coke and Poms apple soda. 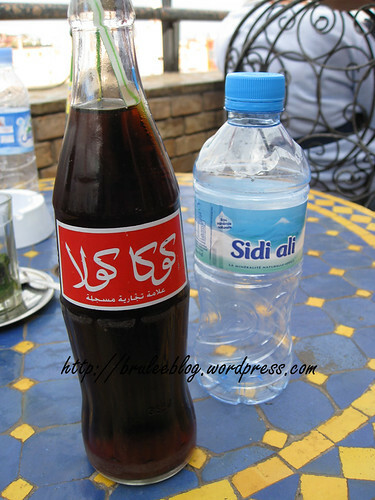 The water is a brand that is all over Morocco named Sidi ali. These pastries were unusual to me because they were covered up so well. 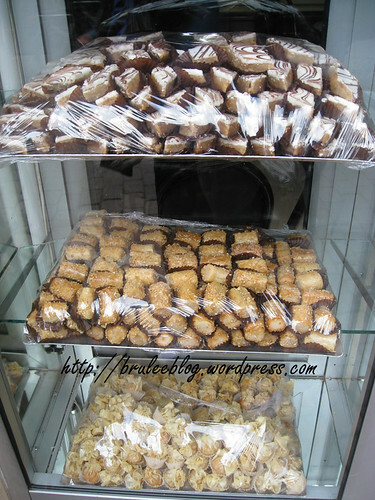 Most of the pastries I saw were in open glass or plastic cases. 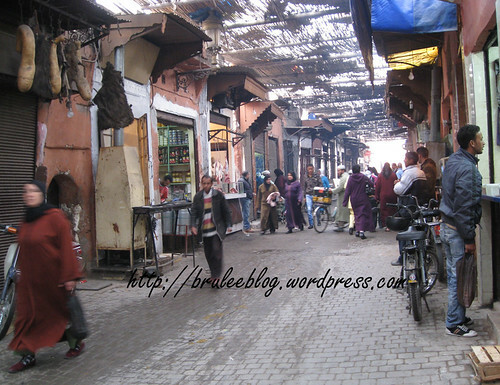 And lastly, a shot of the souk. Incredible photos and fantastic adventure. I can clearly see how you would absolutely love this place after seeing all of these photos. What an adventure! Want to go again? I will go with you! Possibly! But I also have so many other places I want to see…. I adore the butcher picture!! 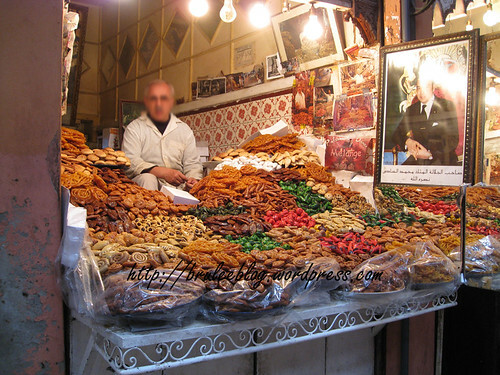 I am going to have a stroke when I go to Morocco. 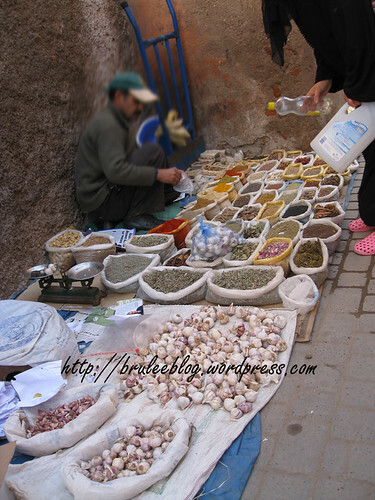 We are planning on Marrakech, but had we not – we would be after reading (and seeing) your great post. I will need two suit cases for all the spices!!! 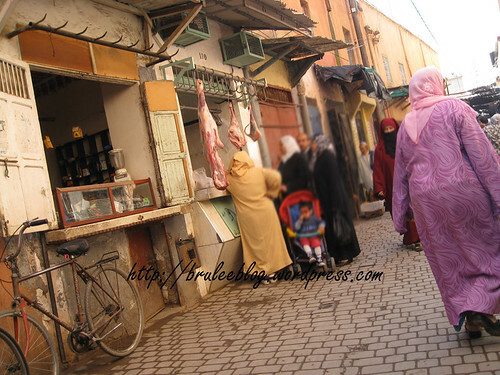 Did you get a tagine? I really, really wanted to but we were only at the beginning of the Morocco trip and were going to be in Spain for 2 weeks afterwards. I really didn’t want to have to haul it around in my backpack for all that time. I could have bought one and mailed it but I figured there was a good chance it would break in transit. They’re cheap and plentiful. But heavy.